This article describes lessons learned from an applied literacy course in which preservice teachers partnered with a local middle school to teach literacy actively through podcast and digital graphic novel creation. Future teachers need equity-focused, production-centered, interest-driven connected learning (Ito et al., 2013) and connected teaching opportunities (Mirra, 2017) that provide deliberate, scaffolded social support as they continually shape or reshape perceptions of self and other. Rust, J. & Cantwell, D. (2018). No One Fits in a Box: Preservice Teachers’ Evolving Perceptions of Self and Others. 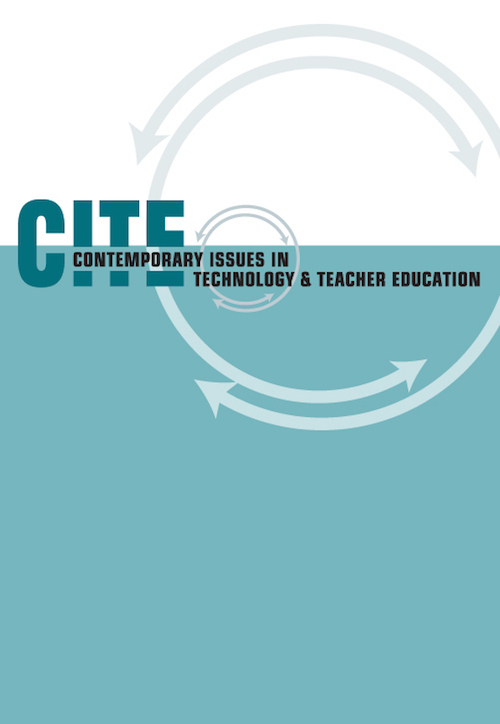 Contemporary Issues in Technology and Teacher Education, 18 (2), 313-342. Waynesville, NC USA: Society for Information Technology & Teacher Education. Retrieved April 22, 2019 from https://www.learntechlib.org/primary/p/180964/. Allan, J. (2004). Deterritorializations: Putting postmodernism to work on teacher education and inclusion. Educational Philosophy and Theory, 36(4), 417-432. Ball, D., & Cohen, D. (1999). Developing practice, developing practitioners: Toward a practice-based theory of professional education. In L. Darling-Hammond& G. Sykes (Eds. ), Teaching as a learning profession (pp. 3-32). San Francisco, CA: Jossey-Bass. Bloom, D., Peters, T., Margolin, M., & Fragnoli, F. (2013). Are my students like me? : The path to color-blindness and white racial identity development. Education and Urban Society, 47(5), 555–575. Britzman, D.P. (2003). Practice makes practice: A critical study of learning to teach. Albany, NY: State University of New York Press. Clark, P., Zygmunt, E., Clausen, J., Mucherah, W., & Tancock, S. (2015). Transforming teacher education for social justice. New York, NY: Teachers College Press. Cremin, T., & Baker, S. (2014). Exploring the discursively constructed identities of a teacher-writer teaching writing. English Teaching: Practice and Critique, 13(3), 30-55. Damico, J., & Rust, J. (2010). Dwelling in the spaces between “what is” and “what could be”: The view from a university-based content literacy course at semester's end. Journal of Language and Literacy Education, 6(2), 103-110. Deleuze, G., & Guattari, F. (1987). A thousand plateaus: Capitalism and schizophrenia. London, UK: Bloomsbury Publishing. Delpit, L. (1988). The silenced dialogue: Power and pedagogy in educating other people's children. Harvard Educational Review, 58(3), 280-299. Dicke, T., Elling, J., Schmeck, A., & Leutner, D. (2015). Reducing reality shock: The effects of classroom management skills training on beginning teachers. Teaching and Teacher Education, 48, 1-12. Hollett, T., & Ehret, C. (2015). Bean’s world: (Mine)crafting affective atmospheres for game-play, learning and care in a children’s hospital. New Media& Society, 17, 1849-1866. Horn, I.S., & Campbell, S.S. (2015). Developing pedagogical judgment in novice teachers: Mediated field experience as a pedagogy for teacher education. Pedagogies: An International Journal, 10(2), 149-176. Irizarry, Y. (2015). Selling students short: Racial differences in teachers’ evaluations of high, average, and low performing students. Social Science Research, 52, 522–538. Jussim, L., & Eccles, J.S. (1992). Teacher expectations: II. Construction and reflection of student achievement. Journal of Personality and Social Psychology, 63(6), 947. Kuby, C.R., & Rucker, T.G. (2016). Go be a writer! : Expanding the curricular boundaries of literacy learning with children. New York, NY: Teachers College Press. Margaryan, A., Littlejohn, A., & Vojt, G. (2011). Are digital natives a myth or reality? University students’ use of digital technologies. Computers& Education, 56(2), 429-440. Paris, D., & Alim, H.S. (2014). What are we seeking to sustain through culturally sustaining pedagogy? A loving critique forward. Harvard Educational Review, 84(1), 85-100. Pratt, M.L. (1991). Arts of the contact zone. Profession, 33-40. Purcell, K., Buchanan, J., & Friedrich, L. (2013). The impact of digital tools on student writing and how writing is taught in schools. Washington, DC: Pew Research Center. Sanderson, D.R. (2016). Working together to strengthen the school community: The restructuring of a university-school partnership. School Community Journal, 26(1), 183. Waddell, J., & Vartuli, S. (2015). Moving from traditional teacher education to a field-based urban teacher education program: One program's story of reform. The Professional Educator, 39(2), 1. Yoon, I.H. (2016). Trading stories: Middle-class White women teachers and the creation of narratives about students and families in a diverse elementary school. Teachers College Record, 118(2). Zeichner, K. (2012). The turn once again toward practice-based teacher education. Journal of Teacher Education, 63(5), 376-382. Zeichner, K., Payne, K.A., & Brayko, K. (2015). Democratizing teacher education. Journal of Teacher Education, 66(2), 122-135.